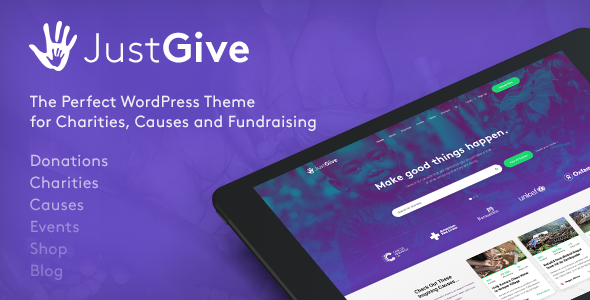 JustGive is a theme perfect for Charities, Causes and Fundraising. Packed full of features and pre-built pages, hit the ground running with your next Charity website by choosing Causes. Weâ€™ve included several custom shortcodes which gives you the flexibility to design your own pages with added customisability. It has a fully designed WooCommerce store with quick and easy checkout process. It also has events pages for those who want to set up fundraising events and offer tickets for a price, or free!